4G is not unfamiliar concept for people who are involved in the environment of mobile internet. Succeeding 3G, 4G is the fourth generation of mobile telecommunications technology. 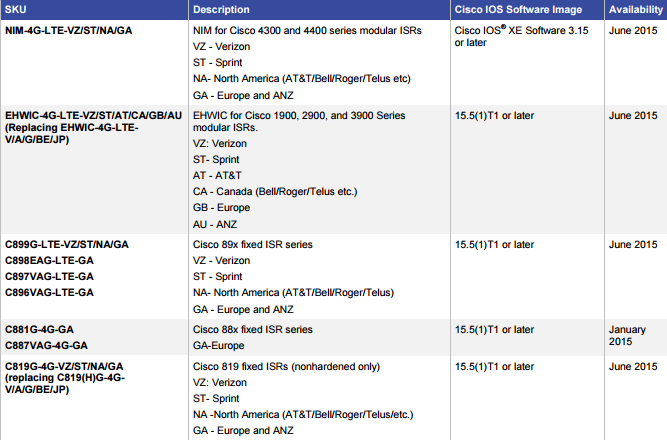 And what is the Cisco 4G-LTE 2.0? 4G-LTE (Fourth-generation Long Term Evolution) standards are defined in the 3GPP Release 8 standard. The 4G-LTE release improves mobile network speeds by 20 times or more. It also lowers latency by five-fold to compete with wired WAN connections. It is an evolution of 3G cellular technology, overseen by the Third-Generation Partnership Project (3GPP) standards body. 4G-LTE is not supported on the first-generation ISRs. Set up wireless WANs without waiting weeks for terrestrial links. Connect in-vehicle users for public safety applications. Create temporary links in construction sites, sporting events, trade shows, and kiosks. Avoid downtime caused by cable cuts by using 4G LTE for routing diversity. Get wired-like communication experiences using less-expensive wireless links. There are many 4G LTE product options and configurations. How do you choose the right ones and put them together into a working solution? First, you need a 4G LTE-capable router and a 4G LTE wireless data service plan from a mobile network provider. The Cisco partner community will help you pick the wireless router solution best suited to your business. Cisco can help you meet your business needs when migrating to a fourth-generation Long Term Evolution network. The Cisco 4G LTE products and solutions accommodate a wide variety of situations and use cases. You can get connectivity built right into a fixed router, whether it’s in a traditional office or hardened for harsh environments. Or you can get the capability as an add-on module to routers you already have. Cisco Integrated Services Routers (ISRs) and smart grid Connected Grid Routers (CGRs) support 4G LTE connections in the branch office. There is an overview of the NIM, EHWIC, and router options for 4G-LTE connectivity. An EHWIC and a NIM, the Difference: NIMs run on the newer Cisco ISR 4000 (4400 and 4300) plaforms in a powerful NIM slot, while EHWICS run on ISR G2 (1900, 2900, and 3900) platforms.